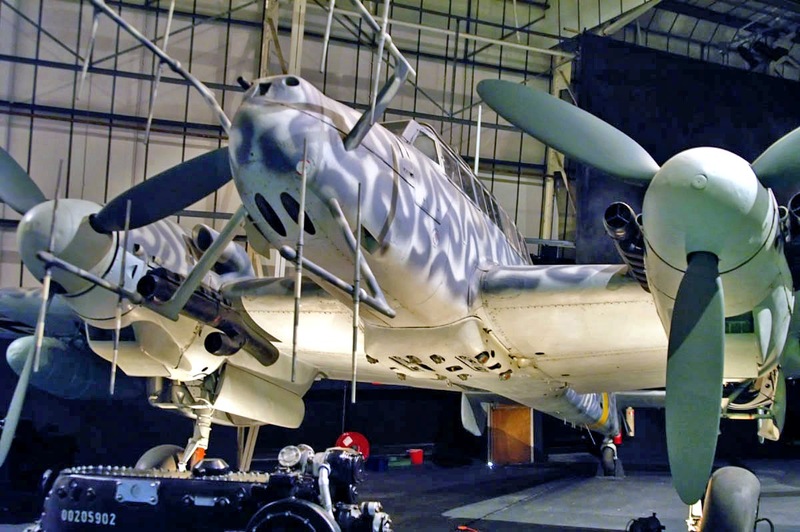 A Bf 110 G-4 in the RAF Museum in Hendon, with second generation FuG 220 Hirschgeweih antennas, without the short-range FuG 202. The importance of a comprehensive and efficient air-signal service in aerial warfare is obvious. The transmission of all orders, observations and communications was done by wireless radio, an absolute necessity for the successful conduct of air operations. Radio provided reliable communication and new and accurate navigational systems and bad-weather landing aids. German airborne radio equipment included Funkgerät (FuG), composed of transmitters and receivers; Peilgerät (PeG), or navigational equipment; and Notsender (NS), or emergency transmitter. Aerial warfare, whether the aircraft were bombers, fighters, or other types, was (and still is) a much more individualistic matter than is war on sea or land. Flying crews had to be highly trained and able to absorb all the details of a mission given to them in their briefing. A lot of detailed organization was necessary before any aerial operation. A little time before take-off, last-minute instructions (regarding matters such as change in the weather) could be most important. During the 1930s, scientists in Britain and Germany were working on newly developed electronic aids to navigation, but because of the different objectives of the two countries, one defensive and the other offensive, development followed two opposite directions. Thus, while the British gave priority to developing a defensive system of radar, the Germans concentrated on building up radio aids for bombing. The German systems which emerged were based on the Lorenz beam. This was basically slightly overlapping radio beams broadcast by ground stations, transmitting Morse dots and dashes. Where the signals interlocked, an aircraft received a steady note by means of a computer; any deviation either way resulted in a changed signal, thus even an inexperienced pilot could follow a predetermined course. The simplest of these methods was the intersecting Knickebein (“Crooked Leg,” codenamed “Headache” by the British) which employed two Lorenz beams, one to hold the bomber on course right up to the target, while the second crossed the first at the point where the bombs should be dropped. Knickebein was used in the early stages of the German night-bombing offensive against England, and proved to be fairly effective. When it was jammed, another system was developed. 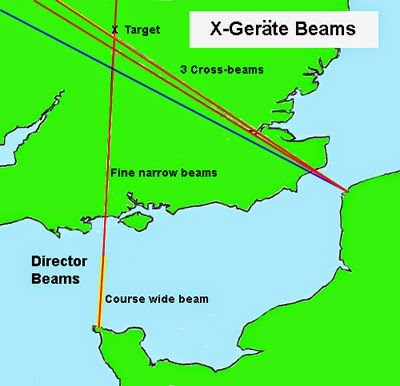 X-Gerät (X-Device), was more accurate, as it employed four Lorenz radio beams (each named for a river: Weser, Rhine, Oder and Elbe), and each on a different frequency: one held the aircraft on course to the target while the other three crossed it at intervals, giving a warning of approach, the last signal making an electrical contact that automatically released the bombs. As good as X-Device was, British efforts to jam it were successful. A final system, Y-Gerät “Wotan,” consisted of a single, accurate beam directing the bomber to its target. The disadvantage of the Lorenz beam was that it could be jammed or even deflected so that the German bombers sometimes unwittingly dropped their deadly projectiles at sea or in open country without even knowing they had missed their target. Some bombers even landed at RAF bases, believing they were back in Germany. Another disadvantage of radio navigation was that the approach to a target greatly simplified the organization of the defense because all bombers followed one another along a defined lane which could be patrolled by fighters or barraged by anti-aircraft artillery. In the end, German faith in electronics was completely shattered and navigational aid was abandoned. The term “radar” (an acronym for “radio detection and ranging”) was coined in the United States and was soon universally adopted. In German, though, radar is called Funkmeßgerät (FumG in short). Radar is a detection method based on broadcast of strong and short radio impulses. Waves are reflected if they meet a solid metal flying or navigating body. By measuring the time from the departure of the impulse until the return of the echo, one may calculate the distance between the radar station and the target. Radar thus detects and determines with precision the existence and position of a target. Radar equipment used during World War II were complex, bulky and cumbersome instruments compared to modern devices. Not always totally reliable, it included a powerful generator using very high frequency microwaves, a highly sensitive receiver catching back-echoing beams, sophisticated devices translating radio waves into visual flashing form on a screen, scanners, primitive computers, and various precise calculating instruments, as well as large antennas. Nevertheless, radar, which had been in almost an embryonic state at the start of World War II, developed as a more-or-less reliable detection system, often providing observers with a map of the sky above them. It also developed as a navigational aid, providing aircrews with a map of the terrain below, which was—in theory but not always in practice— unaffected by clouds or darkness. The German night-fighter branch was headed by Oberst Joseph Kammhuber, who for years waged a fierce struggle in the night above the German skies. War in the air became an immensely sophisticated exercise in tactical and technical ingenuity in which the professional fighting men were at least as dependent on the expertise of scientists as they were on their own skills to carry out their task. Air war was waged by small groups of highly trained fighting men operating complex weapons systems developed by specialized technologists and scientists, and under the leadership of commanders exercising control at very long distance. Originally limited to bulky ground-to-air equipment, technology evolved as World War II proceeded, and miniaturization enabled the use of airborne radar fitted to night fighters. Waves were sent off and received back by means of a bulky aerial which in some cases could slow a night fighter as much as 50 km/h. The British introduced countermeasures— such as “window” aluminum stripes jamming German radar, and night-fighter hunters, such as the De Haviland Mosquito—to each new Luftwaffe radar system which appeared. In turn the Germans frantically developed new devices such as Spanner-Auflage (trouser press), an infrared searchlight designed to expose exhaust gases in the wake of a distant bomber. These devices were mounted on a few special night-fighter designs. The Messerschmitt Bf 110 remained the primary Luftwaffe night fighter until 1944; the aircraft (G version) proved able to take the addition of radar, a third crewman to operate it, and heavy armament. Other night fighters included the Heinkel He 219, and modifications of existing designs of Me 220 and Me 410 variants, Dornier Do 217 E and N, Junkers Ju 88 G-7 and Ju 188. Airborne radio and radar were used in cooperation with ground radar stations: early warning sets (Freya, Mammut or Wassermann) for long-range detection, Würzburg Riese for aircraft interception control; and Würzburg, used for short range and height finding. Other types of equipment distinguished between friendly and hostile airplanes. On the basis of information from these various sources, hostile aircraft were plotted in a central headquarters. Proper warning then was given and defensive fighters were put in the air to intercept attackers. Information on the course and expected target of the bombers was passed by radio to the airborne interceptors until contact was made.